“American values” used to include some respect for biblical morality, being opposed to abortion, supporting only male-female marriage, discouraging use of mind-altering drugs, etc. Since her election to the Senate, Harris has maintained a 100% rating by the pro-choice Planned Parenthood Action Fund and a 0% rating by the pro-life National Right to Life Committee. 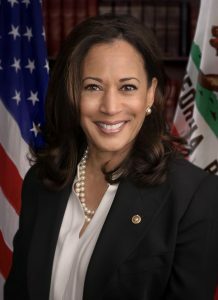 It appears that to run as a Democrat for president, one must condone the killing of unborn babies as well as sexual immorality that the Bible condemns (Romans 1:18-32). Now that is NOT a statement of support for Republicans per se nor Donald Trump. Expressions of regret for past positions out of step with today’s Democratic Party have become an early staple of the presidential race. While White House aspirants have long sought to dispense with unflattering elements of their records, the velocity of the party’s leftward shift has Democratic hopefuls scrambling to catch up — making remorse an early staple of the campaign. The grueling, eight-minute segment Gillibrand endured on Rachel Maddow’s show Wednesday night on her ideological transformation was probably only a taste of what’s in store. It is a sorry state of affairs. As for Donald Trump, here is a link to my article Donald Trump in Prophecy, which has a lot of information about him and many of his issues. The 2020 presidential election will feature people who are against many aspects of biblical morality. It seems like all who are potentially major candidates for the 2020 presidential election advocate and promote several positions which are not biblically good. Many of those statements apply to those who wish to win the 2020 US Presidential election (from whatever political party). Now none of who are expected to be candidates for USA president will turn the nation back to God, thus none will truly fix the problems in the USA. It will take the return of Jesus Christ and the establishment of the Kingdom of God to do that. Politico’s comment about the sorry state of those seeking the office of US President in 2020 is correct, but more so in ways it has not considered. There are reasons the USA, leader of the West, will be eliminated as a nation towards the beginning of the Great Tribulation (watch also our latest sermon video The Bible, the USA, and the King of the West). This entry was posted on Monday, January 21st, 2019 at 2:30 pm	and is filed under Prophecy.